If you’re a business dealing with medicines then you must follow pharmaceutical waste disposal guidelines. Direct365 can help by removing your waste efficiently and safely, and doing so at the best price on the market. Depending on drug types, your pharmaceutical waste may be classified as hazardous or non-hazardous. Every business disposing of medicine waste (vets, surgeries, care homes, pharmacies, opticians and many more) will need a pharmaceutical waste bin. Our service includes flexible collections and a variety of bin sizes, so you only pay for the frequency you need. We’re always professional and friendly – if you don’t know what you need, just ask! Call us for more information and an instant quote, and you could save up to 30% compared to your existing service. Do I need Pharmi Waste Collection? As a business, you’re fully accountable for the waste you produce, whether it's a tiny amount each month, or you’re disposing of a large amount of pharmaceutical waste (EWC Codes 18-01-08 and 18-01-09). There’s a lot of legislation surrounding how you should dispose of your waste; and this is where we can help. At Direct365 we provide a safe and compliant service for the disposal of your solid dose medicines, and also ensure you receive the necessary Duty of Care certification and a consignment note to show your legal compliance. We'll guide and advise you to arrange your pharmaceutical waste collection which is tailored to your business needs. Our pharmi bin waste containers can take all of your pharmaceutical waste from drugs to prescription medicine, including cytotoxic and cytostatic wastes. All of our units are designed to seal shut, and can be permanently sealed for security and health reasons once they have been filled. With a range of pharmi bin sizes and collection schedules available, whatever your waste requirement; we’ve got a plan for you. Since the Landfill Directive came into use, we've had to change the way we dispose of your pharmaceutical waste in order to comply with all the correct laws and legislations. Every type of waste, including pharmaceutical, has an EWC code, which is a unique identifier that enables us to see exactly what your waste is, and where it needs to go. 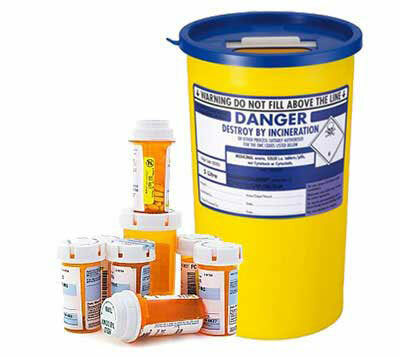 An EWC code is printed on all clinical buckets and bags, including your pharmaceutical waste container.